While the practice of sport has many advantages in the education of children such as the development of motor skills or the desire to succeed, collective play teaches them about mutual support and cooperation. While the practice of sport has many advantages in the education of children such as the development of motor skills or the desire to succeed, collective play teaches them about mutual support and cooperation. In addition to these educational benefits, sport is also a way for many young people to improve their social standing and meet children from different backgrounds. AGS, through its subsidiary managers, encourages initiatives that promote these values. 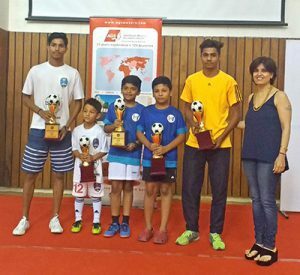 In New Delhi, Payal Singh, Manager of AGS Movers India, has chosen to sponsor the Delhi Youth League, an organisation that aims to develop soccer among young people aged 6 to 19, from all social, cultural and religious origins. With the motto “the best teaching is the game itself”, the Delhi Youth League brings together children from underprivileged backgrounds supported by NGOs who play for free, as well as students from international, public and private schools who pay to play. Through soccer, children discover teammates that they would never have encountered in their everyday lives. In addition, every week during the season from September to April, budding players participate in matches and learn the discipline and rules that govern the competition. Throughout the year, following every match, each coach selects the “Most Valuable Player” (MVP) of the match in the opposing team. The MVP is not necessarily the one who scored the most goals, but the one who contributed most effectively to the team’s performance. At each game, AGS offers a soccer ball to both players. On 27 May, the league recognised, in each age group, those who had been designated MVP most often during the year. AGS sponsored this award and Payal Singh was there to present the award at the ceremony at the British School in New Delhi. Established in 2012, the league has experienced a growing enthusiasm as evidenced by the 1000 youths playing across six age groups during the 2016-17 season. Thanks to soccer and the values associated with sport, the league offers young people from very different backgrounds, opportunities to express themselves, to better understand each other and to become agents of social change. 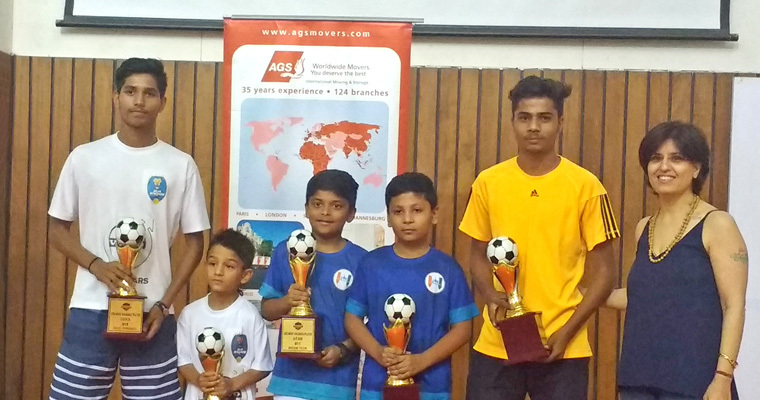 Under 7, U9, U11, U13, U15 and U19 with AGS India Manager, Payal Singh.